Sometimes, you need elevation. You might need to reach something on the top shelf, or you might be trying to look over a wall, or maybe you're trying to escape out a very high window. But what do you do when there aren't any trees, hills, ladders, or stools around? Simple: You stand on your friends. A Human Ladder occurs any time someone climbs on someone else for added height. Generally, one stands on the other's shoulders, but other methods show up. Some Human Ladders consist of more than two people, although the more you add, the sillier it gets. The person at the base is often The Big Guy, but a common enough gag is to have the person at the bottom be the smallest one in the group. Hilarity Ensues when they topple over. Add a coat to become a Totem Pole Trench. See also Chain of People. Made strangely epic despite being very silly when dozens of waddle-dee's form a literal latter that many more dozens waddle-dee's use to get back inside Dedede's castle in Kirby: Right Back at Ya!. 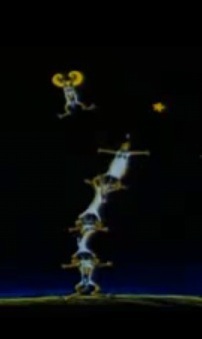 One Piece makes use of this during the climax of the Alabasta Arc, when, in a pinch due to the ticking time bomb at the top of few hundred foot high clock tower, Vivi is literally catapulted up the side of the tower by her crewmates, starting with Usopp on the ground, Chopper on his shoulders in his deer form, and Vivi on his back. Nami uses her Clima-Tact to create energy to send Chopper and Vivi into the air, where Sanji and Zoro, both at various points on the tower, jump off the side and give the two a boost, until finally Chopper tosses her to the time bomb's location. Cue Vivi's Crowning Moment of Awesome. Digimon: Agumon and Palmon are involved in a Digimon pyramid with other Digimon. In this case, they were forced to do it by Nanimon. A bunch of the Ham-Hams stack up on one another to see if they can reach the stars thinking the stars are candy. In another episode, the Ham-Hams all stack up to try to form a big shadow to see if they can chase away what they think is a monster. Monster Rancher: When they needed Suezo to see out over a field they form a pyramid; he can't get high enough, so in the end they just throw him in the air. There is a Mind Trap card that involves this. Two people are trying to reach something in a tree—one is five feet tall, one is six feet tall. The five-foot person stands on the shoulders of the six-foot person, but the object is just out of reach. Would it help for them to switch places? Yes, because the taller person will probably have longer arms. In the comic MadroX: Multiple Choice by Peter David, Jamie Madrox (AKA Multiple Man) creates several duplicates of himself to create a ladder so he can get over a fence into someone's property. There's an Avatar: The Last Airbender fanart, where Sokka decides the best way to see over a wall is by having Toph stand on his shoulders. Mulan: The soldiers pile on each other to better see where Mulan and Shang are. In this version, Chen Po, The Big Guy is on the bottom; Ling, the tall thin one is in the middle; Boisterous Bruiser Yao is on top. The Count of Monte Cristo: In the 2002 film Edmond allows the priest to stand on his shoulders so he can see out the window. One of the Pink Panther films had a gag where Kato is standing on Clouseau's shoulders to see through a window, but can't. Clouseau orders them to switch positions "because I'm taller than you!" DuckTales (1987): Treasure of the Lost Lamp had the nephews stand on each other to allow Webbie access the security room in the Money Bin. In The Russians Are Coming! The Russians Are Coming!, the final climactic scene is where the American small town police force and milita are facing off against the deck guns of a Russian submarine, with the rest of the town watching. Two boys climb up the church tower to get a better look, one of them falls and is caught by a protruding nail and left dangling 30 feet in the air. The Americans and Russians both drop everything and work together in forming a human pyramid to rescue the boy, releasing the tension and allowing cooperation between the groups to help the submarine get away. The dogs in All Dogs Go to Heaven do this during the "You Can't Keep a Good Dog Down" segment. Four of the main protagonists in The Land Before Time do this to try to get leaves down from a tree. Since Petrie couldn't fly, they formed a ladder. Spike was supporting Littlefoot, who was supporting Ducky, who was supporting Petrie. In the My Little Pony movie, the Grundles do this to help Lickety Split and Spike find their home. In The Care Bears Movie 2, Grumpy Bear, Tenderheart and Brave Heart did it to try to steal a key from Dark Heart. In The Monkees movie, Head, after Davy, Micky, Mike and Peter get sucked into the giant vaccuum, they notice that Davy is missing. The other three do this to see if they can find Davy in the hole they came out of. The Parent Trap: Sharon and Susan do this while they're in the lake to try to fool Vicky into thinking the water is shallow. All four of the Beatles do this to take out the apple-boppers in Yellow Submarine with John at the top and George at the base. In Oliver and Company, during the "Perfect Isn't Easy" number, five dogs stack up on each others shoulders up against a tree to get a better view of Georgette. Antz features a truly epic example near the end. The Muppets do this upside down in The Great Muppet Caper to steal the baseball diamond before the bad guys. Dr. Seuss' Yertle the Turtle: Yertle commanded all his subjects to stand on each other so he could see further. In one of the Olga Da Polga books, Olga tells a story about how ages ago, all the guinea pigs decided to go to the moon by standing on each others' shoulders. It doesn't end well. Used in Pournelle's Falkenberg's Legion and David Drake's Belisarius series as part of standard assault tactics to get over the wall of a fort. Falkenberg's Legion also goes one better. To quickly cross a (small) barb wire entanglement, an armored soldier lays on it, providing a makeshift path for his fellow soldiers. This duty is generally performed by the newest soldiers, being lowest on the totem pole, and being the least experienced. Goosebumps: Two kids did this in R.L. Stine's book, "Ghost Beach". The Twilight Zone Classic episode "Five Characters in Search of an Exit". Used by the title prisoners in an attempt to escape a large room they were trapped in. Star Trek: The Original Series episode "Patterns of Force. An imprisoned Kirk and Spock do this so Spock can get close to a light bulb and use his crude laser to cut open the door lock. Watch it here, starting at 6:50. In the series finale of Robin Hood, Robin, Much, and Gisborn are caught in a trap that is rapidly filling with limestone. They realize that if one of them stands on the other's shoulders, he'll live. Robin is picked to stand on them. In the "Archeology Today" sketch from Monty Python's Flying Circus, an interviewer (Michael Palin) pays more attention to a tall archeologist (John Cleese) than a short one (Terry Jones). Eventually jumping on top to become taller happens. In The Goon Show, Seagoon, Eccles and Bloodnok attempt to escape from prison by climbing on each other's shoulders to reach a high window. Even with all three of them, they still aren't high enough, so the person at the bottom climbs up onto the top person's shoulders. Three times. The step jump in Army of Two is pretty much this. Goes a bit crazy in Time Crisis 4 where a lot of National Guards goes into this mode so that the main characters can climb them up to stop the Big Bad and the nuclear strike. In Mother 3, this is the Mr. Saturn race's favorite pastime. Disgaea had an interesting game mechanic that allowed you to stack your WHOLE TEAM on each others' shoulders, allowing you to throw members across the map. Of course, the guy on bottom takes damage proportional to the weight of the team on top of him every turn, so it's a somewhat advanced tactic. Buffed up a bit from the first sequel onwards with two improvements. First, you no longer take damage when carrying allies, and second, the tower itself can attack enemies within a short range (one hit for each person in the tower,) making the human ladder viable for more uses than simply quick transport across the map. In the Sega Genesis game, World of Illusion, during the 2-player mode, there are some instances where Mickey and Donald have to pile up on each other to reach certain areas. One boss fight in Contra: Hard Corps involves this, probably to block you from jumping across them. Luckily, there are other ways to dodge their attacks. In Paper Mario, the Koopa Bros. do this when they're battling Mario in their second form. Donkey Kong Coutry Returns has yellow versions of Itty Bitty Biters that stack up on top of each other and and lunge at the player. Drawn To Life has stacking baki enemies with one large baki at the base and three small baki's on top. In Kingdom Hearts: Birth By Sleep there is a totem pole-like enemy that uses elemental magic. In the original Kingdom Hearts game, there are certain parts of the game where Sora, Donald and Goofy need to stack up on each other's shoulders to reach certain things. Legend of Mana: During the end of the quest in Lake Kilma, the sailors make a ladder to get back to the top of the lake cliff. Red vs. Blue A human ladder is also used by Sarge and Caboose to see into a square window. Homestar Runner: In the toon "The Search for the Yello Dello", Homestar and Pom-Pom do this to boost Strong Sad up to the Yello Dello so that he could tell it a boring story that would put it to sleep so that they could catch it. In the Wallace and Gromit short "A Close Shave," a ladder of sheep, with Wallace at the bottom, helps break Gromit from prison. The Simpsons: Springfield did the "human pyramid" version, trying to get into the Duff Book of World Records. There's also a gag where a group of cheerleaders do this in a sandstorm, which leads to them getting buried, and looking like an actual pyramid. The kids on Recess did this quite a few times. Once they did it to time a clock to get out of school. In the animated short, Little Wolf, a group of wolves climb onto each other to help a little wolf get down from the moon. The babies would do this in Rugrats with Phil and Lil forming a base, Chuckie standing on them and Tommy standing on his shoulders. The Amazing Spiez. In "Operation Spy-Sitter" three of the title heroes form one to reach a sprinkler control on a wall. In Captain Planet, Kwame and Wheeler do this to access an air vent after the gang is trapped in a mine shaft. In one episode of Invader Zim, Zim persuades fellow prisoners to form a human pyramid so they could escape. Well, so Zim could escape. The Three Musketeers (part of The Banana Splits show) episode "The Haunted Castle". After being trapped in a well, Athos, Porthos and Aramis form one to escape. A standard technique of the main pups in 101 Dalmatians: The Series. Aaahh Real Monsters: The monster protagonists do this sometimes. Done quite regularly by Donald Duck's nephews, Huey, Dewey & Louie. Done frequently on Scooby Doo. In an episode of Doug, Doug and Skeeter do this to try to achieve a frisbee while Porkchop distracts the bull dog guarding the yard. Done quite a few times in the Winnie the Pooh franchise. In an episode of Tiny Toon Adventures, Buster, Babs and Plucky did it to listen in on something Yosemite Sam was plotting. Only Buster heard what was going on since he was on top, while Plucky was in the middle, and Babs was on the bottom. Done frequently by Alvin and The Chipmunks. In an episode of Teenage Mutant Ninja Turtles, the turtles (excluding Donatello) stacked up to fix a light. The totem collapsed when Michaelangelo (at the base) got up to do something not realizing he was still supporting the totem. In the Animaniacs episode, "Hello, Nice Warners", the Warner kids do this to try to escape from Mr. Director. In the Dexter's Laboratory episode, "D2", Dexter and Dee Dee do this throughout the episode taking Dexter's brains and Dee Dee's stature to their advantage. In the Powerpuff Girls episode, "Silent Treatment", the girls do this to try to reach a phone. In this case, they had to since they were unable to fly. Done a number of times by the Ed's and by Sarah and Jimmy in Ed, Edd 'n' Eddy. In an episode of Sheep in The Big City, Sheep is shown standing on top of a human pyramid, but he is soon chased off by Lady Richington, who winds up taking his place at the top of the pyramid causing people witnessing this to cheer. On an episode of Kipper, Kipper climbs onto Tiger's shoulders so he can return a baby bird to it's nest. In the My Little Pony Friendship Is Magic episode, "Hearts and Hooves Day," the Cutie Mark Crusaders do this to reach a cloud that they need for the love potion that they try to make. In an episode of Cow and Chicken, Cow, Chicken and Flem do this to spy on the new school bully. Similar to the Pink Panther example above, Cow put herself on top because she was the tallest. Word Girl: Lady Redundant Woman can do this with her army of duplicates. Had been done a few times in The Magic School Bus. After much infighting and dithering, Tina puts together a human ladder to rescue Louise from the old taffy factory in Bob's Burgers.